A 1 bedroom, 1 bathroom unit within Apartments on Upton. ‘Apartments on Upton’ is Wanaka’s brand new apartment complex with the ultimate in flexibility. Every bed is able to be a king or split into 2 singles. With brand new, high quality furnishings including leather couch, fully equipped kitchen and tiled bathroom, you will be treated to modern, sophisticated, upmarket living for your next stay in Wanaka. The apartment has its own private outdoor area with comfortable seating. BBQ is provided to ensure you can make the most of the warm summer evenings. Heat-pumps throughout ensure your stay is warm and cosy on those chilly nights. Ski storage and drying facilities are also available within the complex. The unit is fitted out with a flat screen television and stereo with iPod capability. Wireless internet is available at an additional cost. 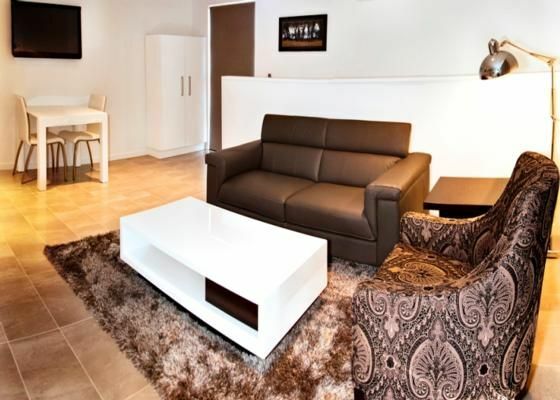 With the ambiance of the apartment you really will be treated to the ultimate holiday accommodation for your getaway. Cleaning is included in the tariff if the stay is for 3 or more nights, stays under 3 nights a $50 cleaning fee will apply. The place was very large, perfect for a couple looking to stay in Wanaka for a few days. Has a large balcony with BBQ and a fully loaded kitchen. The only minor issue was that a dishwasher was advertised, but one wasn't in the room, not a big deal though. Nice bathroom and comfortable bed. Easy access to parking and nice walk to downtown. OUR stay at Wanaka was delightful. OUR stay at Wanaka was delightful. We were greated warmly by Shirley, when we collected our keys and everything was handled beautifully by all who had involvement in our stay. The Unit was Very clean and well appointed and all the fixtures and fittings worked well with no complaints. The local town has a HUGE supermarket and great BIG selection of wines both local and afar for sale. As we self catered for part of our stay this was VERY easy. Scenery is stunning, great base for Central Otago. Lovely place to stay, walkable to shops and restaurants. Lovely place to stay, walkable to shops and restaurants. Wanaka is a great base for mountainbiking. Absolutely fantastic. A real highlight of our stay in Wanaka. Brand new, impeccably clean and super comfortable. The cooling pump was brilliant when you're trying to get ready for a wedding in hot weather! Wouldn't hesitate to recommend and would love to stay again. Thank you! Very spacious, tidy apartment in good location close to town. Very spacious, tidy apartment in good location close to town. Would have liked Sky TV to watch cricket but very nice place to stay in Wanaka. Good location, close to restaurants etc. Good location, close to restaurants etc. Well equipped, lovely shower, very comfortable bed and plenty of room for two.